:Puppies, birds, gerbils, and more! Kids will see God's creativity as they interact with the playful animal stickers in this set. This collection has a watercolor look and feel and includes frogs, birds, hippos, and more, using illustrations taken from The One Year Devos for Animal Lovers by Dandi Daley Mackall, illustrated by Jacqueline L. Nu ez. Includes 6 sheets with 9 stickers per sheet for a total of 54 stickers. 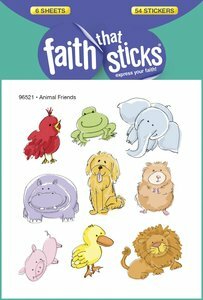 About "Animal Friends (6 Sheets, 54 Stickers) (Stickers Faith That Sticks Series)"